Wigan Athletic gained an important three points with a tight victory over QPR. Latics had been two goals up with a quarter of an hour to go but a deflected goal for the visitors changed the complexion of the game, Latics hanging on in grim defence until the final whistle. 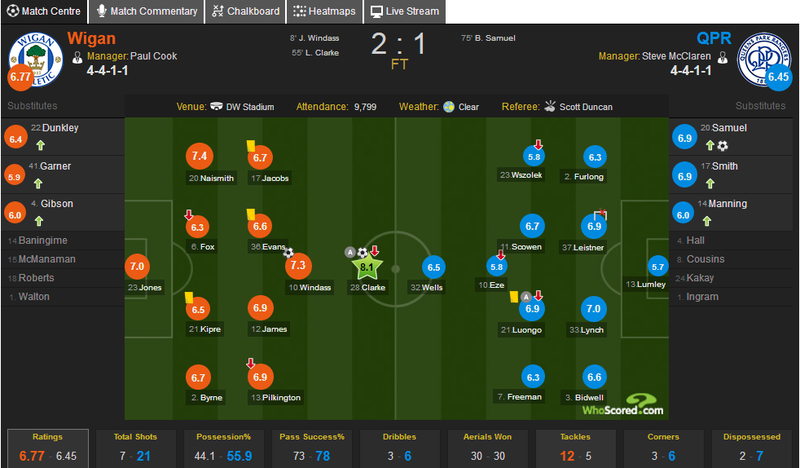 This time Wigan took their chances better than the opposition, having 7 shots on goal compared with 21 for the visitors. A surprise in the team selection? The inclusion in the starting lineup of new acquisitions Leon Clarke and Danny Fox came as no surprise. But playing the latter at centre back, leaving Chey Dunkley on the bench, was somewhat unexpected. One of the frustrations of fans over the transfer window was the failure to sign a specialist left back. Although Fox played in that position so many times in his earlier career his more recent experience has been at centre back. So, Cook decided to continue with Kal Naismith at left back, not a universally popular decision with supporters. In the event, Naismith was one of the better performers on the day. Antonee Robinson is now back in training and will be challenging for a place over the coming weeks. Will Naismith and Robinson be the contenders for the left back position for the remainder of the season? Or will Cook opt for more experience by bringing in Jonas Olsson at centre back and pushing Fox across to full back? Dunkley has so often been the stalwart of Latics’ defence, so it was a surprise to see him left out. However, his distribution in recent games had left much to be desired. It is the part of his game that he needs to work on, if he is to prove himself as a quality player at Championship level. Dunkley made his entrance after 77 minutes for Fox. The other surprise was to see Reece James replacing the suspended Sam Morsy in midfield, rather than Darron Gibson or newcomer Beni Baningime. But James had been pushed forward late in previous encounters and had looked comfortable there. After an uncertain start James grew into this match, showing his great range of skills. The result of those selections was some degree of improvement in the passing of the ball from the back and added creativity and drive in midfield. Clarke to be Cook’s first choice striker? The departure of Will Grigg caused a lot of ripples among the Latics faithful. Grigg’s goals twice propelled Wigan out of League 1 and were a major feature in last season’s FA Cup run. But more than that it was his combination with players like Michael Jacobs, Gavin Massey and Nick Powell that led to Latics playing their best football in recent years. The signing of Leon Clarke for the second time and the departure of Grigg did not go down well with many fans. Clarke had been unimpressive in his previous spell under Malky Mackay in 2015, scoring just one goal in ten games. Earlier in the transfer window rumours had linked Latics with big target men such as Gary Madine and Tom Eaves. It was therefore no surprise that the 6 ft 2 in Clarke was signed. Neither was it a surprise that Grigg was sold, having been consistently snubbed by Cook in his team selections. Clarke was arguably Wigan’s best performer against QPR, scoring a goal and providing an assist. Moreover, his hold-up play was excellent. Although we did see intermittent spells of good football from Latics in this game the approach was largely direct. It would not have suited Grigg. With the departures of Grigg to Sunderland and James Vaughan to Portsmouth we can expect Clarke and Joe Garner to be the main choices for the central striker position, although Cook still has the option of using Nick Powell in that position when he is fit. For the moment it looks like Clarke will be the first-choice. His linking up with Josh Windass was a feature of this game and holds promise for the future. While the January 2019 transfer window will be immediately memorable for the departure of a Latics icon it might well prove to be successful in terms of bringing in experience. Leon Clarke (33), Danny Fox (32), Jonas Olsson (35) and Anthony Pilkington (30) are seasoned professionals at Premier League and Championship levels. Cook has talked about needing leaders in the dressing room. His choice of Fox as captain in his first game for the club underlines that. Alex Bruce (34) departed for Kilmarnock, but despite that there is now a better balance in the squad in terms of youth and experience. Osayi-Samuels’ deflected 74th minute goal gave QPR new impetus. Cook’s reaction was to bring on Gibson and Garner for Pilkington and Clarke, then Dunkley for Fox three minutes later. The substitutions were most likely due to fitness issues. The outcome was Latics being very much under siege, frequently hoofing the ball away only for it to return very quickly. In the end Latics did survive although the visitors hit the crossbar and had a strong penalty appeal turned down. The substitutions hardly improved things, Gibson in particular having a torrid time. But Latics’ confidence is still brittle, and they did not have the confidence to patiently build up moves from the back and manage the game more effectively. Nevertheless, aimless long balls to nobody in particular hardly help such game management. Latics picked up three yellow cards to QPR’s one. It takes their yellow card tally to 66 for the league season so far, with 3 reds. Only Nottingham Forest have a worse disciplinary record with 75 yellows and 5 reds. Neighbours Bolton closely follow Wigan with 61 yellows and 2 reds. On the positive side it could be said that the stats indicate a team putting in lots of effort in a fight to avoid relegation. On the other hand, how many of those cards could have been avoided by a more controlled aggression?